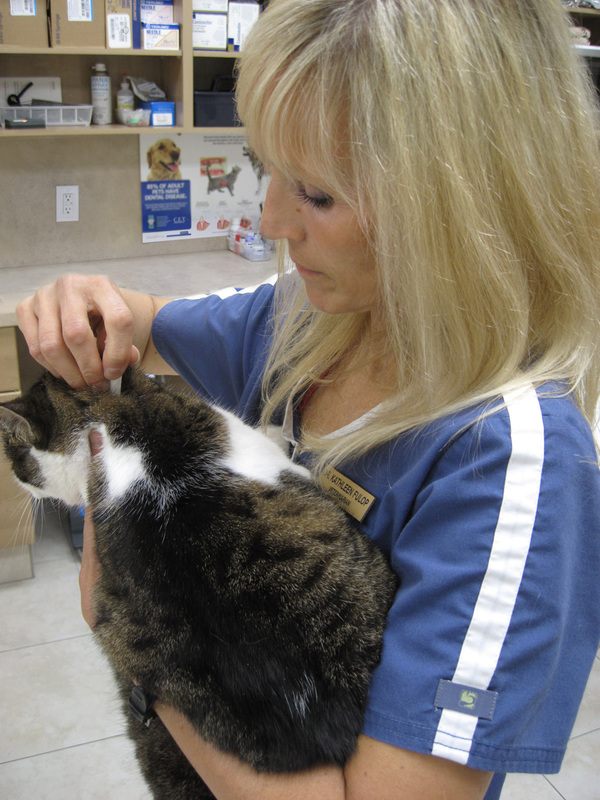 Dr. Fulop applying flea and heartworm prevention to our clinic cat Amber. I wonder if any of you can relate? Last night I got into bed early looking forward to a good night sleep and just as I was settling in, I heard the ominous buzz of a mosquito around my head. I turned the lights on to locate that pesky pest, but of course no mosquito in sight. I turned the light off and just started to settle in and that buzz surrounded my head again and then even worse – the buzzing stopped. To avoid getting bitten I turned the light on and jumped up on the bed scanning the room for that pesky mosquito. Needless to say after doing this several times I woke up the next morning with mosquito bites. The reason I tell this story is to remind pet owners with indoors pets that they can still be at risk for Heartworm disease and fleas/ticks. Talk to your veterinarian about protecting your indoor pets. Interestingly, a recent Bayer study found that pet owners felt indoor pets need less veterinary care than outdoor pets. Unfortunately, indoor pets still get sick, with illnesses that affect us all, for example, diabetes, cancer, dental disease. Prevention is the best medicine. Visiting your veterinarian on a regular basis can help detect concerns early so that proper actions can be taken to help improve your pet’s quality of life. What my story illustrates is that outdoor pests, like mosquitoes, fleas and ticks, can make it indoors. As a result, we protect our clinic cats against Heartworm (transmitted by mosquitoes) and fleas even though they don’t go outdoors. Again, talk to your veterinarian about how they can help keep your pets stay happy and healthy.